How Buddhism is represented in the media is something of deep interest to me. We live in a visual culture that has long employed images of the mystic Orient for our own purposes. How the Asian other has been and is represented is not just a reflection of how “we” see “the other”; it is also a reflection of how we see ourselves, a reflection of our own desires, hopes, and fears. Consider the recurring theme of the “yellow peril” from the late nineteenth century through the first half of the twentieth century. In repeated media images, news reports, and literature, American fears of Chinese and Japanese immigrants and the rising power of the Empire of Japan colluded to create narratives of a dangerous Asia challenging Western civilization. 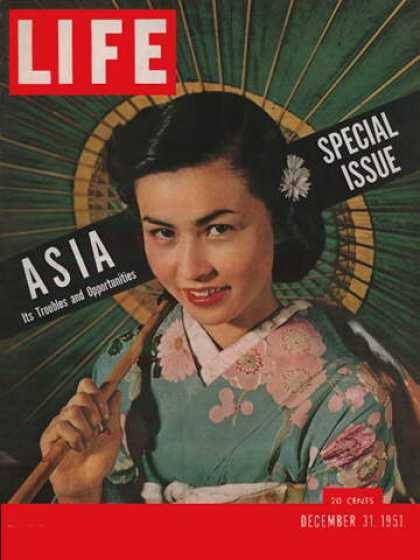 In the post-war years, “Asia” having been effectively “conquered” by the Allied Forces, the Asian other was recast in often subservient roles. Thus, the sinister Fu Manchu was replaced in literature and media images by the passive (and, not at all irrelevant, highly sexualized) geisha. Buddhism, as an Asian religion, gets caught up in these representations. At present (lucky for us), Buddhism is extremely popular in the United States. Even if a mere one per cent of Americans self-identify as Buddhist, a surprisingly large number of folks think favorably of Buddhism. And the most recurring media representation of an Asian Buddhist? The Dalai Lama, a non-threatening peace activist. Picture this: millions of followers gathering around a central shrine that looks like a giant UFO in elaborately choreographed Nuremberg-style rallies; missionary outposts in 31 countries from Germany to the Democratic Republic of the Congo; an evangelist vision that seeks to promote a “world morality restoration project”; and a V-Star program that encourages hundreds of thousands of children to improve “positive moral behavior.” Although the Bangkok-based Dhammakaya movement dons saffron robes, not brown shirts, its flamboyant ceremonies have become increasingly bold displays of power for this cult-like Buddhist group that was founded in the 1970s, ironically, as a reform movement opposed to the excesses of organized religion in Thailand. While the images themselves may evoke any number of responses in the viewer, the accompanying copy makes explicit how we are meant to understand and react to these photographs. In sum, we should be afraid. Two separate references to Nazis (the Nuremberg-style rallies and brownshirts) tell us as much, and the description of this community as a “cult-like Buddhist group” effectively separates Wat Phra Dhammakaya from the larger religion of Buddhism, setting it squarely in the same category of Heaven’s Gate and Jim Jones. And this group is on a mission. Quietly, its agenda of restoring positive moral behavior around the world has reached thirty-one countries via its own satellite TV network. One can’t help but notice parallels here with that century-old fear of the yellow peril, a fear of a mass of yellow faces invading the world, displacing Western hegemony. 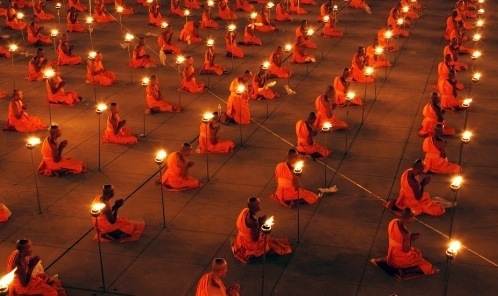 The essay informs us that most Thai men will join a monastery, spending part of their lives as a monk. This rather common practice in many Theravada countries seems recast in this article as cult-like behavior. The temple’s architecture is described repeatedly as a UFO or “Mothership” and, coupled with the title of the article (a reference to the Steven Spielberg alien movie) reinforces the sense of difference. This community is not of this earth; it is literally alien. Finally, “Fireworks provide a Disney-esque touch to the culmination of the massive Buddhist gathering.” The Disney reference is interesting. Are we meant to assume that Wat Phra Dhammakaya has the same shallow character as Disney and thus not to be taken seriously? Or are we meant to think that they have they same global cultural reach as Mickey Mouse? This is how Asian Buddhism can be easily represented in the media as something singularly “other,” something thoroughly different and strange and potentially dangerous. But everything that seems otherworldly and dangerous about this particular brand of Buddhism can be easily found in Western culture, in our own dominant religious Christian culture. 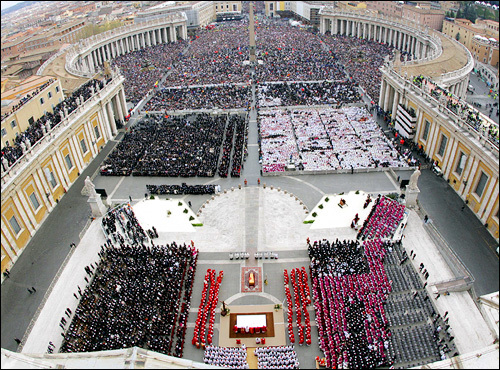 It would be fairly easy to describe the throng of pilgrims in St. Peter’s Basilica on Easter as a participating in a flamboyant ceremony, a dangerous rally. And the Catholic Church certainly has its share of media outlets. Spaceship-like buildings? Easy to find in Christianity. And last I checked, Disney didn’t own the rights to showy fireworks displays, nor were done that.) The point, again, is that by being attentive to media representations of one’s religion/culture we can learn an awful lot about who we think we are. This entry was posted in dharma and tagged Asia, Buddhism, media, representation. Bookmark the permalink.